Pakistan and China kicked off their ambitious 46 billion US Dollar China- Pakistan economic corridor (CPEC) project. It was kicked off after China successfully acquired over 2,000 acres of land in restive Balochistan to develop the strategic Gwadar port. Earlier both countries had signed a deal in this regard to give the usage right of the land to a Chinese company. Under this ambitious project, China is expected to invest around 1.62 billion US dollars in the Gwadar project. It includes construction of an expressway linking the harbour and coastline with a rail link, breakwater. It also includes other 9 projects which is expected to be completed in three to five years. 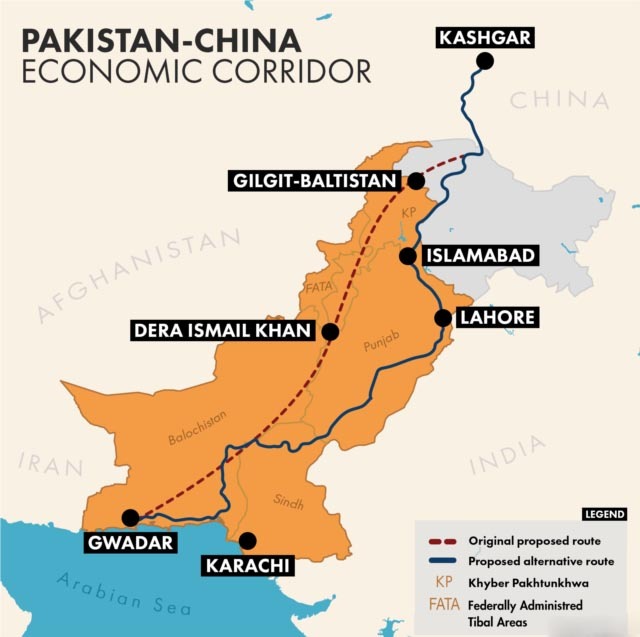 CPEC seeks to connect the Gwadar port in Pakistan to the Xinjiang region in China by means of highways, airways and railways and also deploy pipeline to transport oil and gas. The corridor will also act as a trade route for Chinese goods and commodities meant for the Middle East and Africa. India has already objected to the China Pakistan Economic Corridor as it passes through the Pakistan occupied Kashmir (PoK). However, China has defended the project saying it is a commercial venture aimed at improving livelihoods of local people in Pakistan and strengthening the infrastructure in this region.